Where the Rivers Meet. . . The Kamo & Takano. Several rivers flow through Kyoto. 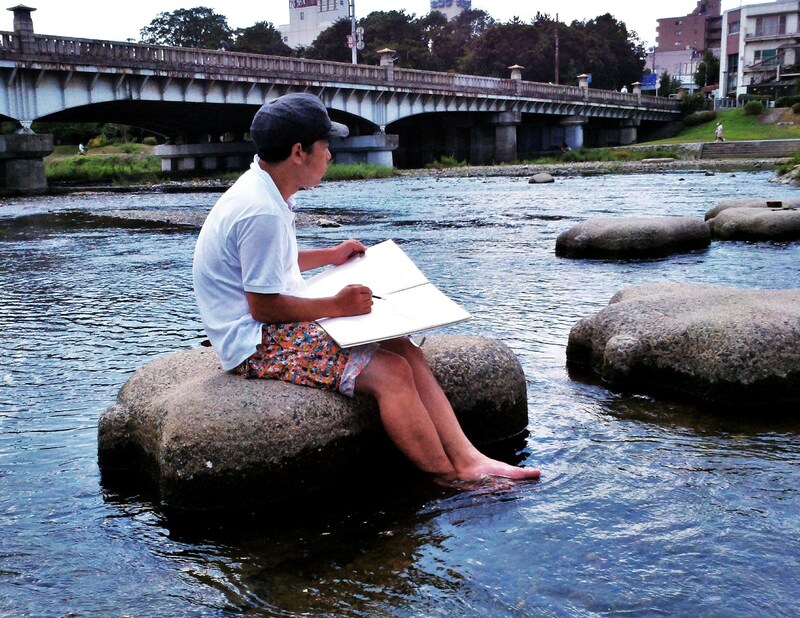 The most famous is the Kamo River (or Kamogawa — “gawa” or “kawa” means river in Japanese). 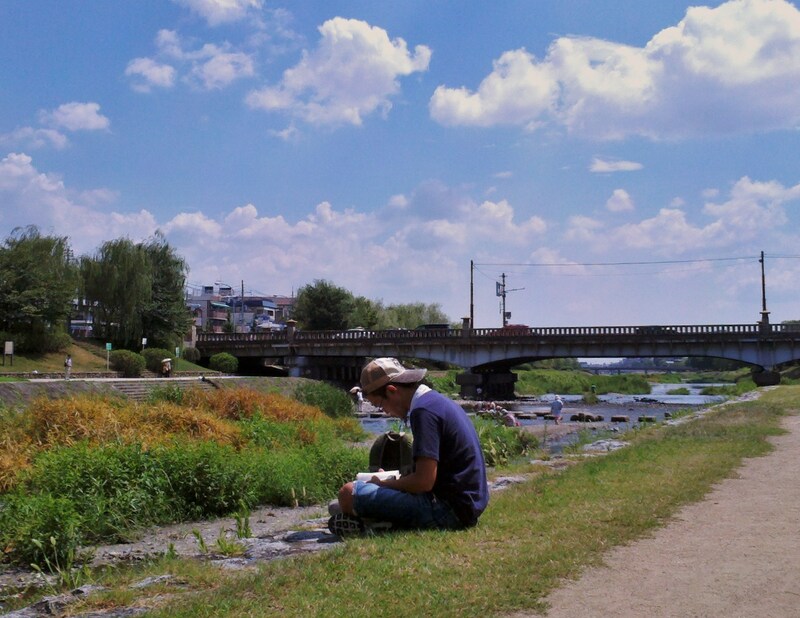 In English that would be the “Duck River.” The Kamogawa flows north-to-south through Kyoto. 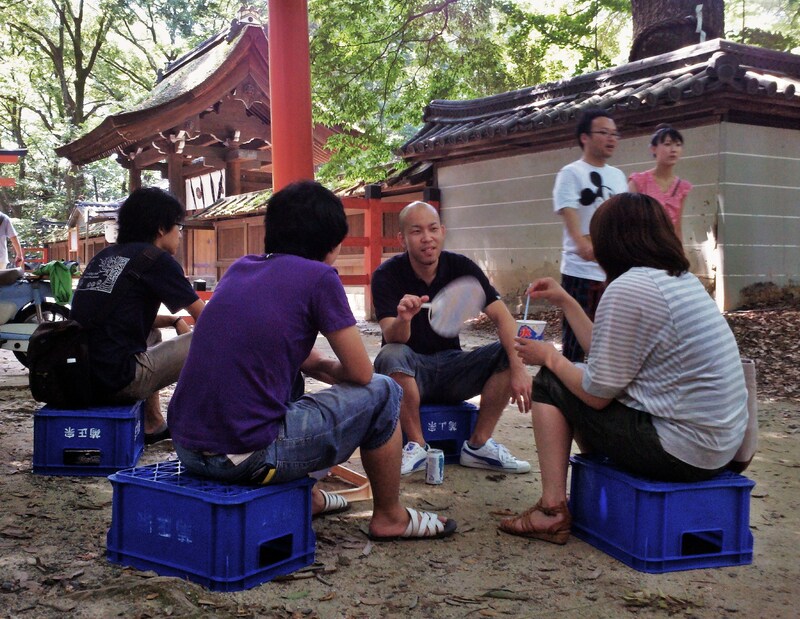 In the spring, summer and fall restaurants along the Kamogawa’s west bank — mostly from about Ni-jo Street down to Shi-jo Street, and a little below that — put up platforms, “yuka,” for patrons to dine on and watch the river and people down on the riverbanks. I posted just about that here: Yuka Season. Where the Kamagawa & the Takanogawa Meet. Kyoto. 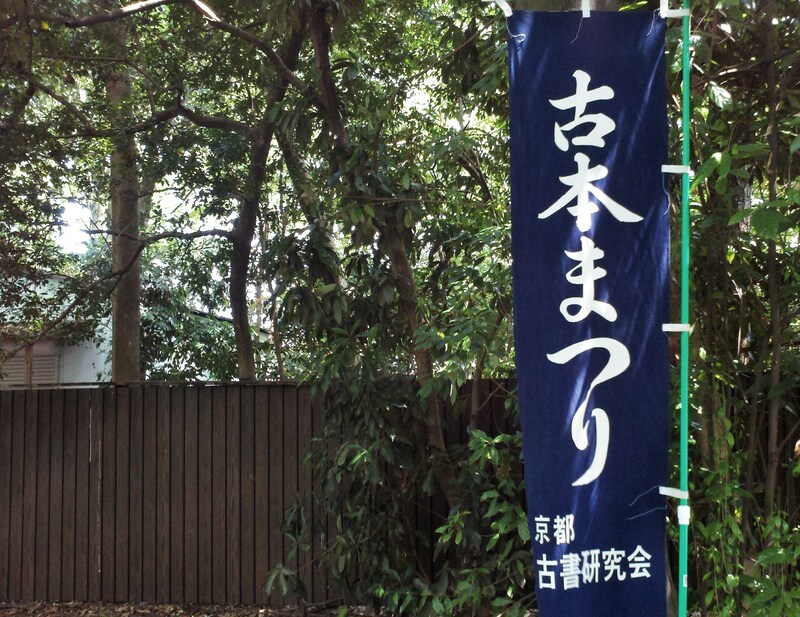 “Old Book Festival” — Japanese style flag outside of the Shrine. 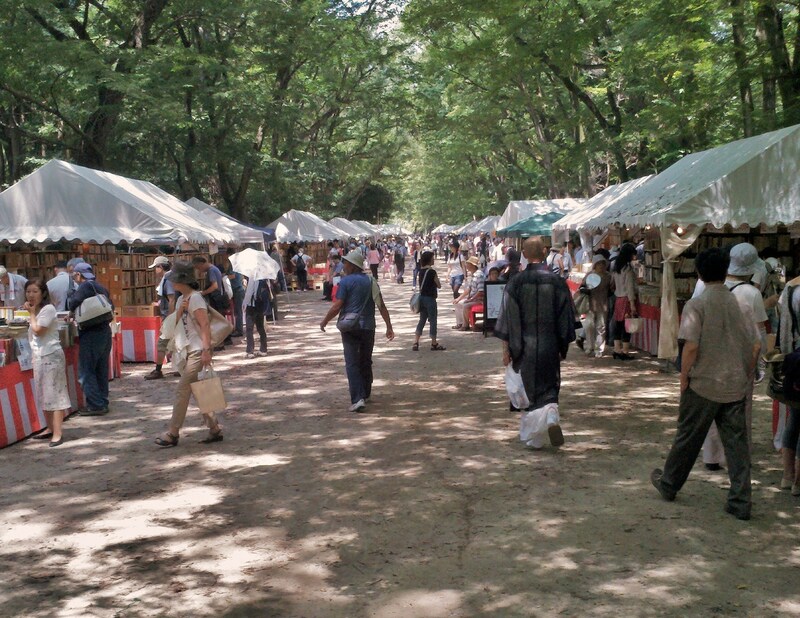 The used & antique book festival. Shimogamo Shrine. Kyoto. Bargain hunting. 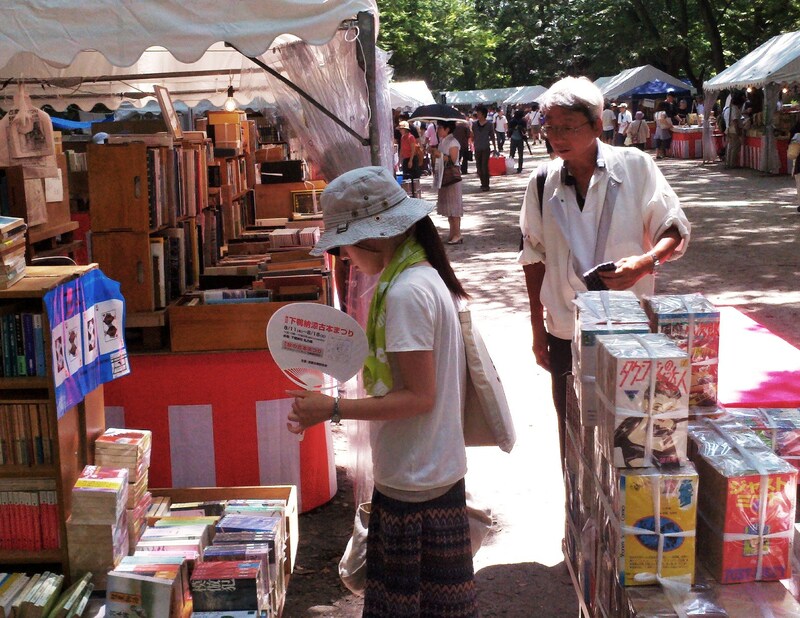 Old book festival. Shimogamo Shrine. Kyoto. Old maps. Cheap. Shimogamo Shrine. Kyoto. Friends taking a break, cooling off. 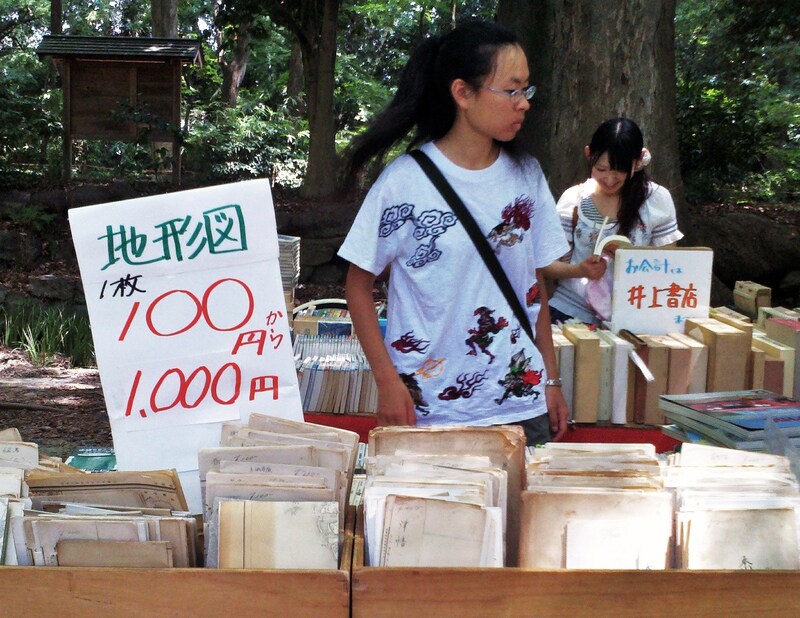 Shimogamo Book Fest. Kyoto. I spent about forty-five minutes at the book festival. Picked up a few bargains. 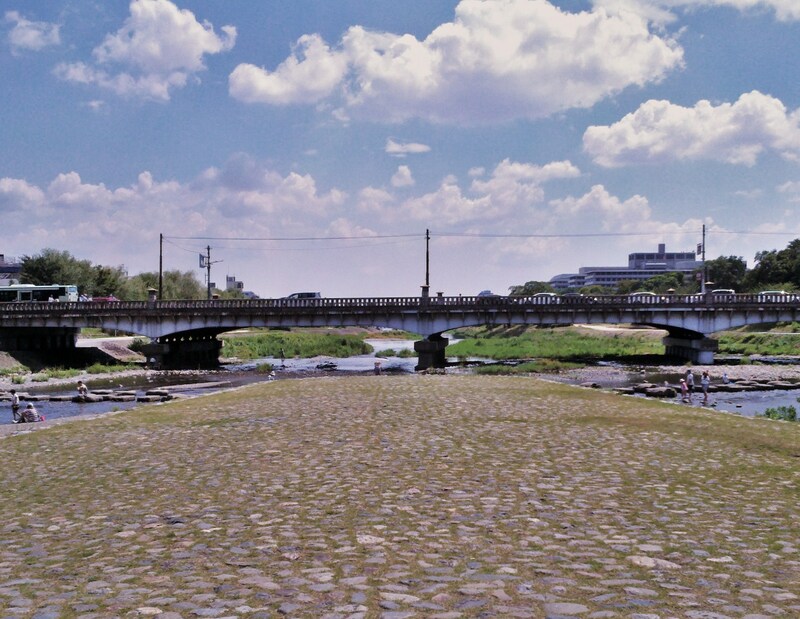 Then I walked south out of Shimogamo Shrine and within five minutes was making my way along the bank of the Takanogawa, heading towards its meeting point with the Takano River. 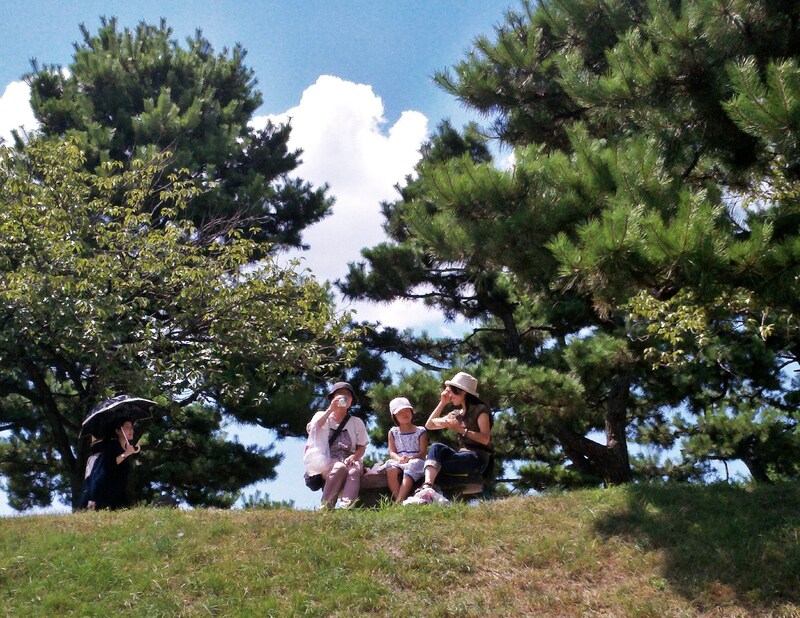 . .
Three generations (I asked) of ladies along the Takano. August 13. Mom and Daughter. Shallows of the Takano. August 13. Young fellow reading. Takano bank. August 13. Takano (left) & Kamo (right) Rivers come together. Kyoto. August 13. “Here’s the ball, Rags! Here’s the ball!” Takanogawa. August 13. 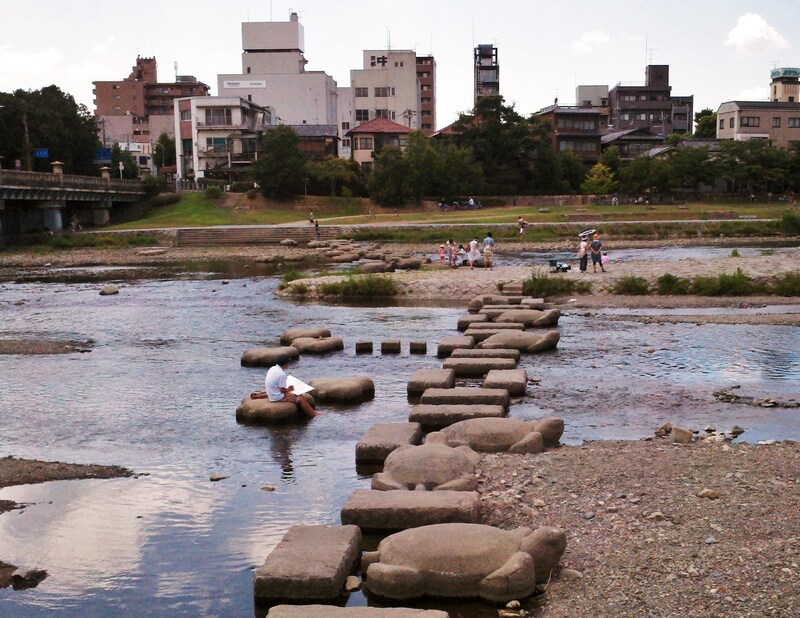 Stepping stones across the Kamogawa/Takanogawa. August 13. Summer Afternoon Sketching. 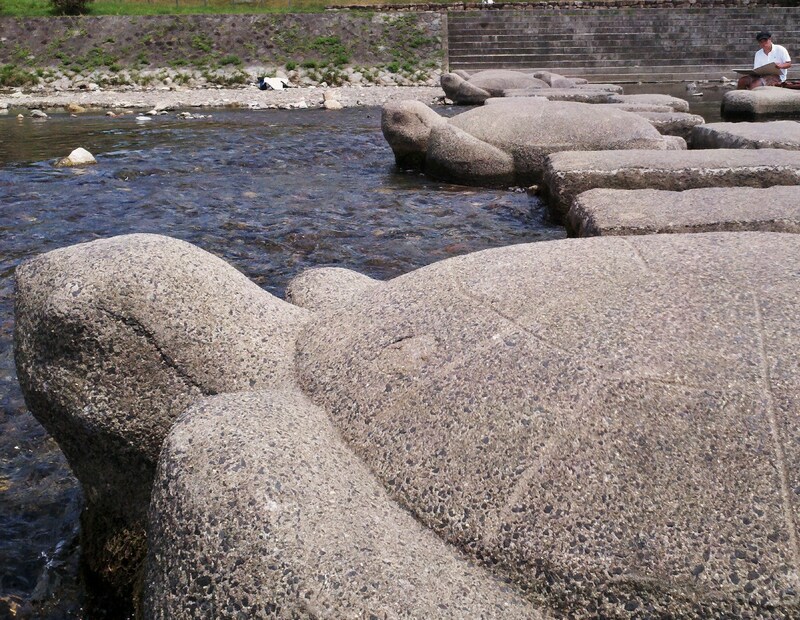 The Kamogawa. Kyoto. August 13. River Turtles. Kyoto. August 13. 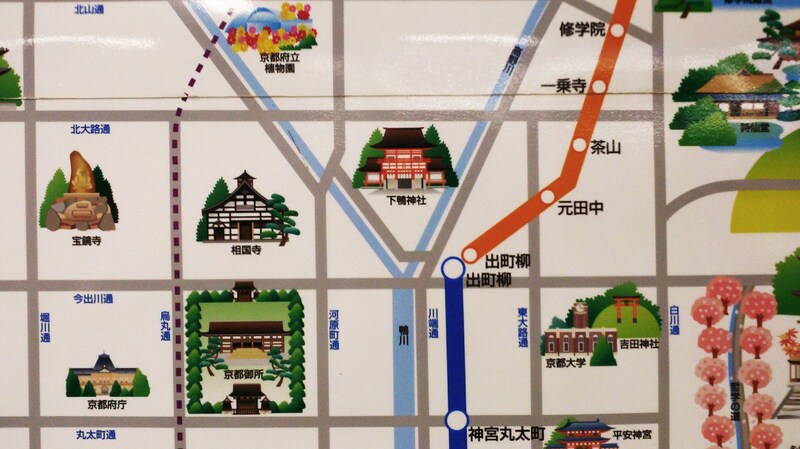 I used to live near Kyoto. During college student days. If I ever live there again, if I ever live in Kyoto, and especially if I have kids, this is a place we’ll go to and enjoy often, on many an afternoon . . . Bonus Shot. 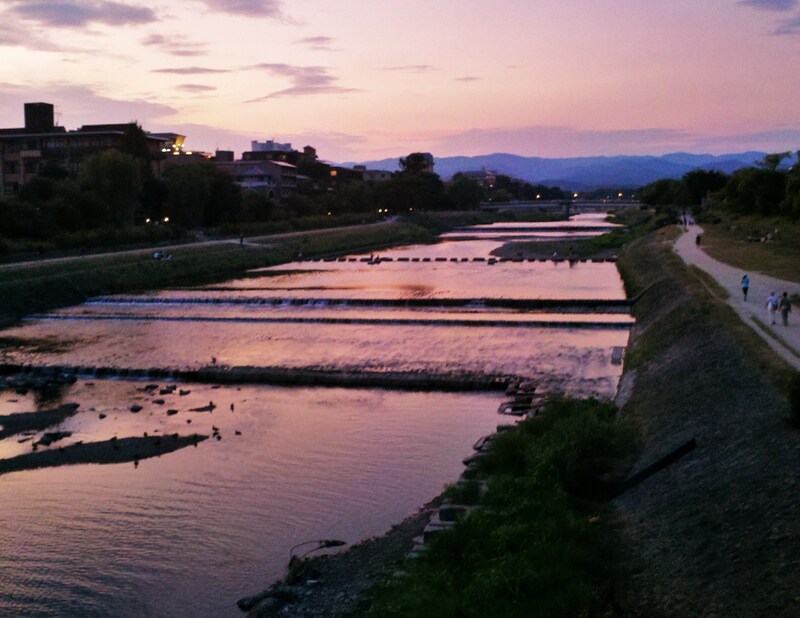 I took this later that evening, while standing on the Ni-jo Bridge, looking back up the Kamogawa . . .
Sunset on the Kamogawa. August 13, 2011.